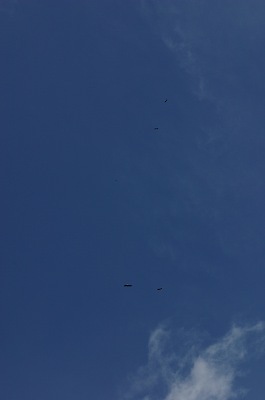 Today was the first time that we’ve seen eagles from the house. Many times before on the island, and even at the end of the lane, but never here before. Rose spotted one circling low above the trees, soon to be joined by another. One circled a while at treetop (100′) or so over the yard for a while, but soon they caught the thermal coming off the trees to the north. By the time I had the camera out, they were small specks – pretty soon we identified 5 just taking in the thermals to get some altitude. This is all 5 of them in one shot. Hummingbirds seem to be attracted to my office. One flew in and knocked itself out a month ago, on Friday another one flew in. This one didn’t manage to knock itself out. He just wanted to leave the office through the skylight. Rule #1 in hummingbird rescue. Lock Jasper in the house. He had an attitude like “Hey Hey, what is this little morsel?” and was quite annoyed at the ejection from the game. After that, it was a simple matter of catching the bird in my hands, getting down off the desk, and letting him fly away.